Sudan's Conflict Spreads: Start of a New Civil War? If you've never thought much about pavement, take a drive from Juba to Nimule. Parts of South Sudan's busiest road have been paved, but the unfinished parts are still teeth-rattling stretches of pitted, rust-colored dirt. On a dry day, each passing truck leaves a impenetrable dust cloud in its wake; after a rain, pocks in the earth degenerate into red lagoons. The trucks whose tires don't sink into the mud veer wildly to dodge the lakes, sending lesser vehicles scattering. When you finally bounce back onto the pavement, it is so mercifully uneventful that you swear you will never take it for granted again, and before you can make any more promises you won't keep  cathunk! You're back on the dirt, splayed across the backseat like a starfish, bracing against windows and seats with all available limbs. When it's done, the Juba-Nimule road will be the longest paved road  and by far the biggest infrastructure project  in the Republic of South Sudan, the world's youngest nation. 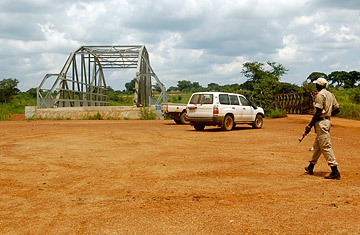 USAID, a major donor to the three-month-old country, is paying for and overseeing the work on the 119-mile (192 km) route and the eight bridges along the way. Work began in 2008, and its total price tag of $220 million is $61 million over original projections. Some have questioned why only a third of the road is finished after three years; others wonder whether those millions of dollars were best spent so near the capital, instead of a more isolated area. Few, however, would argue that the job shouldn't get done. In a country the size of France, there are less than 68 miles (110 km) of paved roads. Most of the nation's limited road network comprises dirt routes in various stages of disrepair. Money for infrastructure did not flow generously to the south from Khartoum, a chronic neglect that was one of many factors fueling the nation's decades of civil war. "Even before the ravages of war could set in, our country never had anything worth rebuilding," President Salva Kiir Mayardit said before the U.N. last month. Now that he and his ministers are in charge, they face the enormous task of creating a road system nearly from scratch. In August, local media reported that the government aims to pave over 4,300 miles (7,000 km) of roads  a feat they estimate could cost nearly $7 billion. It's hard to imagine a weeks-old administration  for which everything is a priority  tackling that so soon. The logistics of building a road in a war-torn nation are daunting. Land mines plague many parts of the countryside and have to be cleared before grading can begin. Because South Sudan is landlocked, almost everything  from skilled engineers to bulldozers  has to be imported over land, a process that itself can get slowed down when, say, pirates off the coast of Africa hold up shipments. With the widespread prevalence of illegal guns, security has to be provided for road crews. On the Juba-Nimule road, USAID expects to spend $10 million alone on security and $8 million de-mining the road. Workers are still finding mines as the job continues. Still, the young government needs to aim high. Without better roads, it won't be able to tackle some of its biggest problems. Despite its ample fertile land, South Sudan has extremely little commercial agriculture, in large part because there is, in most cases, no way to get farmers' produce to market. The nation has one of the highest rates of maternal mortality in the world; more roads would enable more women to get to hospitals before, during or after a complicated childbirth. They could also help rein in the violence that regularly erupts in remote areas of the country. When fighting breaks out between tribes, as it did this August when over 600 people were killed in Jonglei state, troops can't always get to the site of conflict to diffuse the situation. "You put a road in place and it opens up a lot of things," says Kevin Mullally, mission director for USAID in South Sudan. "It opens opportunities ... but if it's not well thought out, it could also destroy certain opportunities." Near the end of the Juba-Nimule road, a breeze blows through a long, narrow surgical ward where patients try to nap through the afternoon heat. There, the staff is already seeing the good and the bad that modern roads will deliver. David Nyuma, the medical director at Nimule Hospital, scrolls through photos on his phone, landing on an image of the hospital morgue piled with contorted bodies. On June 17, two buses collided on the highway, killing 28 people. The twisted heaps of metal still sit on the side of the road; the first several rows of seats are gone. Since the road has been improved, many patients in the area have been able to hitch a ride with passing trucks to the hospital, a government facility funded by the British NGO Merlin. (That's helpful because the government-issued ambulance can't withstand the bumpy local roads and has never been used.) But the number of injuries Nyuma and his colleagues see from traffic accidents has risen dramatically. The problem, he says, is that most South Sudanese have no training in how to obey traffic laws, or how to enforce them. He says many of the motorcycle-taxi drivers who come in after collisions don't have licenses  a hazard on the streets of any village, but a potential catastrophe on a busy trade route packed with buses and trucks carrying goods from Uganda. "The traffic police are not well trained," Nyuma says. "Human beings need to be kept in check with laws. If they are free, they don't care for their lives." Like so much else there, traffic safety too is scrambling to catch up. Last month 17 members of the nation's first motorcycle highway patrol graduated from training, but the government is still working out how to pay for the gas to send the unit out onto the road. The Ministry of Roads recently assured the government that a new road-safety bill is nearly ready. USAID has been helping fill the gap in the meantime, holding road-safety workshops for bus and truck drivers and in primary schools along the new road, where kids are learning things like to look both ways before crossing. At a busy intersection just outside the capital, a large billboard on the side of the Juba-Nimule road reminds pedestrians to use the nation's first zebra crossing. The stripes haven't been painted yet  they're coming. When they do, it may take some time for people to use them. But it will be a lot longer before anyone takes them  or the road they're painted on  for granted. Produced in association with the International Reporting Project. See photos of South Sudan on the eve of independence. See a hidden tour of Juba, the world's newest capital.